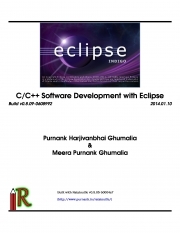 Description of "C/C++ Software Development with Eclipse (eBook)"
[[Purnank]] Purnank was first introduced to Eclipse based IDE in 2003 with IBM(R) Websphere(TM). The early fascination and a gradual influence of a plethora of Eclipse based plugins convinced him more than a Swiss knife for software is finally available. With ever increasing functionality of C/C++ Development Tooling within Eclipse, he though it is the right time to introduce a majority of C/C++ developers what they are missing and started working on this book with his wife, Meera. Reviews of "C/C++ Software Development with Eclipse (eBook)"
If you are just starting with Eclipse this is a great book to begin with. I have been using eclipse off and on for about a year now, and have always wondered why there isn't a better book for C/C++ developersfor Eclipse. I no longer wonderas this book is perfect for my needs. Doug Abbott's, "Embedded Linux Development Using Eclipse" is a close second only because this book is more up-to-date, less expensive, and contains clear step-by-step instructions for the beginner. That said, the book has some great nuggets of information on how to use some of the less understood features of Eclipse such as remote compiling. For the price of this book, you can't lose. Most people throw away more money in a morning trip to the local Java house than the cost of this book. The author has done a supurb job and continues to enhance to book. Meera did this miracle.Get the stone be the winner.I like to say her go ahead be the pathfinder of the winner. The book is best practice for beginners as well as master.